Here is a postcard that is as interesting for its reverse side as for its front. 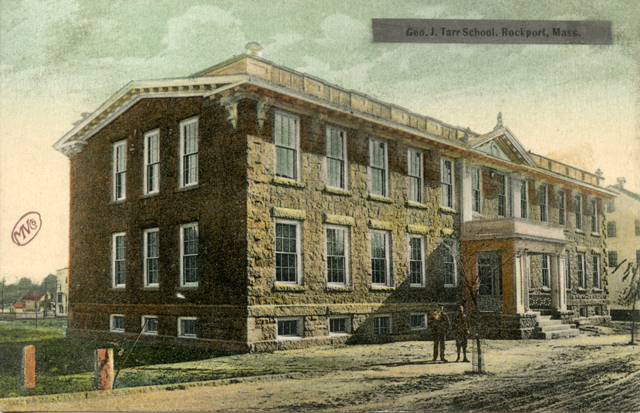 The front shows the George J. Tarr School on School St. in Rockport. As I wrote in a previous post, this building, constructed in 1864, was once part of the Annisquam Cotton Mill that occupied the site between School St. and the waterfront. When fire destroyed the mill in 1882, this was the only building spared. In 1904, when the mill ruins were finally removed, the then-owner of the property, George J. Tarr, deeded it to the town to become a school. Today, the building houses the Rockport Public Libary. Conversion of the building from machine shop to school was completed in 1907, as best I can tell. That is the year of the postmark on the card, so the card must have published shortly after the school opened. All that is interesting enough, but it is the reverse side that caught my attention when I first saw this card. Note the name of the addressee — Capt. D.S. Tarr, Contoocook, N.H. I cannot help but wonder whether D.S. Tarr is a relative of the Rockport Tarrs, who date back to the town’s first settlers. And if so, could this card have been sent by one proud Tarr family member to another to let him see the new school that bore his family’s name? For that matter, could it have been George Tarr himself who sent it? I have found no record of a Capt. D.S. Tarr. There was a prominent Bostonian in the 1800s, active in the temperance movement, named David S. Tarr, but he died in the 1890s. There was also a David S. Tarr listed as serving on one of the organizing committees for Gloucester’s 250th anniversary celebration in 1892. The postcard was published The Robbins Bros. Company, Boston, and printed in Germany. The company was in business only from 1907 to 1912. Robbins had many of its postcards printed and distributed through the Metropolitan News Company, a larger Boston postcard publisher. You can see the “MN Co.” logo on both sides of the card. This entry was posted in Uncategorized and tagged George J. Tarr School. Bookmark the permalink.